From Turkey with Love: Another Israeli attack on Syria? Prime Minister Erdogan and his AK Party government have a track record of being deceitful, especially in regards to both Israel and Syria. No one should be surprised to hear that Israel and Turkey are collaborating together against the Syrians. With the aim of tightening the front against Syria, President Obama even travelled to Israel in March 2013 to directly broker a quick rapprochement between the governments of Israel and Turkey. Getting a public nudge from the Obama Administration, Israel and Turkey would announce that their diplomatic row was over only two days after NATO announced it had put together contingency plans for operations in Syria on March 20, 2013. Even when relations were publicly sour between Ankara and Tel Aviv, the two countries maintained military and commercial ties. Despite the fact that Prime Minister Erdogan denounced Tel Aviv for attacking Syria, the first fruits of Israeli and Turkish collaboration became visible in May 2013 when Israeli warplanes attacked a Syrian military research facility in the town of Jamraya with US approval, as admitted by President Obama to Telemundo. 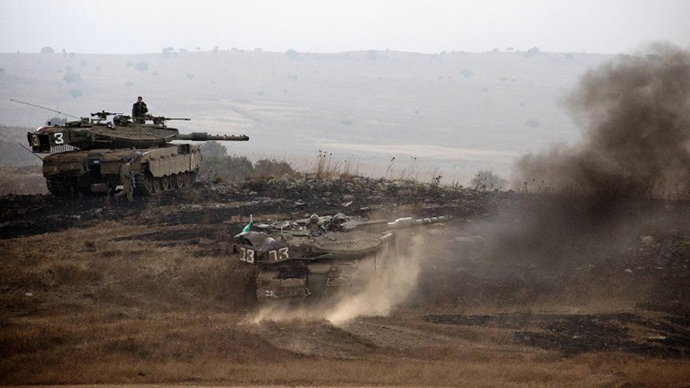 Right after the Israeli attacks the Turkish and Israeli militaries launched simultaneous exercises on their respective borders with Syria. Although the military operations were presented as uncoordinated events, both Ankara and Tel Aviv were coordinating with one another in a military posture against Syria. The Israeli and Turkish moves on their borders with Syria were probably aimed at preventing Syria from responding through intimidation. The Turkish government would also put extra pressure on the Syrians by blaming them for a terrorist attack in the Turkish border town of Reyhanli, which the Turkish activist group of internet hackers named Redhack would reveal was known about well in advance by Turkey’s Gendarmerie Intelligence. Just when it began becoming apparent that the US and its allies were facing serious regional setbacks in the Middle East and North Africa, reports began circulating about an explosion in Latakia. Unverified reports, originating from anonymous sources in Israel in early July 2013, began claiming that Tel Aviv had launched an attack against the Syrian port of Latakia that caused a massive explosion. As the rumours began to circulate in the media, it was dubiously claimed that the Israeli attacks were launched against shipments of Russian-made S-300 air defence systems that were in the process of being delivered to Syria by the Kremlin. US officials would enter the picture by deliberately leaking more information about what happened in Latakia by claiming that Israel used its air force to bomb the port there to destroy a military depot filled with Russian-made Yakhont land-to-sea anti-ship missiles. Then, on July 15, RT’s Paula Slier would report from Tel Aviv that Israel had attacked Latakia by using a Turkish military base. This would upset the Turkish government, which would deny it and say anyone making the claims was involved in an “act of betrayal.” In response to the Russian report, Turkish officials would up the ante by claiming that the Russian anti-ship missiles in the Syrian port were destined for Hezbollah in Lebanon and that the US and Israel had coordinated the attacks by holding meetings in Turkey with the anti-government militias operating inside Syria. Uzi Mahnaimi would complicate the matter by reporting through the British press that the Israeli attacks were launched from a German-built Dolphin from the sea, which essentially vindicated Turkey by refuting the claim that a Turkish base was used by the Israelis. What has to be understood is that countries like Turkey and Saudi Arabia conceal their collaboration with Tel Aviv due to the heavy opposition against the Israeli occupation of Palestine among their respective societies. What is also important to note is that a Turkish jet was downed in 2012 by Syria when it was following a route that was used by Israeli jets near the Syrian-Turkish border. The use of this aerial route by Tel Aviv has never really been challenged by Turkey. It is also part of an important pattern that shows how close the tactics used by Israel and Turkey against Syria are. On June 22, 2012 a Turkish F-4 Phantom fighter-bomber from Malatya in Turkey was shot down above Syrian airspace. There would be conflicting reports about the fate of the pilots. The Turkish media would report that they were rescued while Syrian sources would claim that they were captured. The fighter-bomber’s two pilots, however, would reportedly be found dead trapped under the jet’s wreckage almost two weeks later. Perhaps coming as a surprise to many, the Syrian and Turkish governments would conduct joint search and rescue efforts to find the airplane’s wreck and the two missing pilots. Damascus would even allow Turkish rescue units to enter Syrian territorial waters and make the proposal that a joint Syrian-Turkish military committee be formed to investigate what really happened. Syria would even apologize to Turkey and argue that its troops thought that the Turkish warplane was an Israeli jet violating Syrian airspace. Initially, it was clear that the Turkish government did not know how to react and made several contradictory statements. Erdogan would even say that he was unaware if the Syrians had shot the jet down and was waiting for precise information about the incident. Ultimately, Ankara would claim that the Turkish jet was shot down by the Syrian military without any warnings inside international airspace above the Mediterranean Sea. Later the Saudi-owned Al-Arabiya network—the Fox News of the Arab World—would claim that the two Turkish pilots were executed by the Syrians and had their corpses planted into the wreckage under instructions from the Russian government, which also directed Damascus to apologize and then tried to manage the entire event. What had caught the Turks, and NATO, by surprise was the fact that the Syrians had detected the F-4 fighter-bomber. The Turkish jet was actually spying against Syria on an intelligence mission conducting low altitude reconnaissance work and testing the air defence systems of Syria. This is why the Turkish government quickly changed its position several times. Expecting to be exposed, the Turkish government at first played stupid. At the outset Turkish officials talked about the incident like it was a mistake. They even admitted that the Turkish plane had crossed into Syrian airspace, but said it was an honest accident during a training mission. When Damascus said nothing, however, Erdogan and his government began to aggressively blame the Syrians of unjustified aggression. The Syrians would respond to Ankara’s lies by relying on the technical facts. From a technical standpoint the Turkish government’s story that Ankara’s jet was shot by the Syrian military while it was flying outside of Syrian airspace over the Mediterranean Sea was impossible. The reason was that the Turkish warplane was downed by an anti-aircraft artillery machine gun with a maximum range of 2.5 kilometers, which can only operate from land and operates on the basis of visual confirmation. It would have been impossible for the Syrians to use the anti-aircraft machine gun to target the Turkish jet if it were in international airspace, because it was out of firing range. Surface-to-air missiles would have had to been used instead by the Syrians. Moreover, Syria would even warn NATO as a whole, after Turkey called a NATO consultative meeting under the Washington Treaty’s Article 4, not to even think of violating Syria’s airspace, territorial waters, or land borders. Many of the same tactics that were used against the Libyans by Turkey and NATO have been recycled against the Syrians. The failed Turkish spy mission for NATO in 2012 was actually a repeat of what happen to Libya in 2011. A Syrian pilot had defected by flying with his jet from Al-Dumayr, just northeast of Damascus, to Jordon’s King Hussein Air Base in Mafraq on June 21, 2012. The Syrian pilot, Colonel Al-Hamadeh, even sent his family out of Syria to Turkey before he defected. From Jordon his Syrian jet’s flight codes were passed to NATO and Turkey to disguise or cloak their aerial units as friendly Syrian ones. The Turkish military and NATO had tried to disguise the Turkish F-4 Phantom fighter-bomber as a Syrian jet using the stolen codes. The Syrians, however, were aware of what happened earlier to Libya when two Libyan warplanes defected to Malta and handed over their military flight codes to NATO, which used those codes months later when it attacked Libya as a means of bypassing Libya’s air defence system. Skeptics cannot be blamed for thinking that the story about the Israeli military strike on Latakia was planted to disguise the miserable failure of Washington’s regime change project in Syria, Israel’s growing fears about the regional environment, and the regional decline of the Muslim Brotherhood. Despite Ankara’s denials, the revelation of Turkish involvement in the events surrounding Latakia is pushing the different players involved to talk more. It should be remembered that Prime Minister Erdogan and the AK Party government in Turkey have a track record of being very deceitful, especially in regards to Turkey’s cooperating with Israel and their government’s aggression against the Syrians. In this context, the news that Israel used a Turkish base against Syria to avoid detection should come as no surprise either. Even the same tactical approaches were used by both the Israeli and Turkish militaries in regards to entering Syrian airspace from the Syrian Arab Republic’s northwestern coast. Things will become cleared once, and if, more governments start talking openly about the events that occurred in Latakia. Only then can there be a clear picture of what really happened in Latakia. Nevertheless, there should be no mistake about it that the Israeli-Turkish alliance never really ended and that Israel and Turkey are comrades-in-arms against the Syrians. This article war originally published by RT Op-Edge.